^ 原文："rifle, firearm with a rifled bore—i.e., having shallow spiral grooves cut inside the barrel to impart a spin to the projectile, thus stabilizing it in flight. A rifled barrel imparts much greater accuracy to a projectile, as compared with a smoothbore barrel. The name rifle, most often applied to a weapon fired from the shoulder, may also denote a crew-served weapon such as a rifled cannon or recoilless rifle. Although field guns, pistols, and machine guns have rifled barrels, they are not normally referred to as rifles." ^ 床井 2013, p. 133. ^ 小山 1941, p. 52. ^ 小山 1941, pp. 52-55. ^ 小山 1941, pp. 56-58. ^ a b 小山 1941, p. 95. ^ 床井 2013, p. 132. ^ かの 2012, p. 18. ^ かの 2012, p. 12. ^ a b かの 2012, p. 22. ^ 小山 1941, pp. 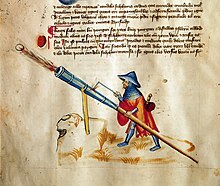 146-147. ^ 小山 1941, pp. 150-151. ^ 小山 1941, pp. 247-249. ^ 小山 1941, pp. 249-252.